You can't be a hero without a cool weapon, right? It's true. In most hero stories, the hero has a special weapon, often one that only he can use. 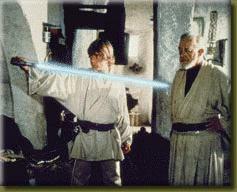 Luke uses a light saber, an outdated weapon of the Jedi Knights, in Star Wars. Here's Luke testing the light saber Ben has just given him. The saber belonged to Luke's father. Only a Jedi can master this weapon. 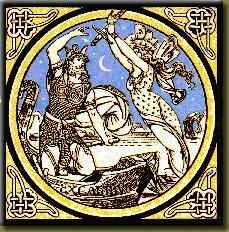 This is an illustration from the 1800's of Arthur receiving Excalibur from the Lady of the Lake. 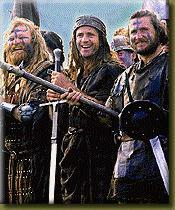 When Arthur died, Excalibur was thrown back into the lake because only Arthur could wield this weapon. Here's Wallace with his sword. While it doesn't appear to be anything special, only he was allowed to carry it because it represented his power and prowess as a warrior. Here's another painting by Michelangelo from the Sistine Chapel depicting Moses at the Red Sea. Notice his staff (He's on the left, in yellow and green, with the staff over his right shoulder). That's the same one he used to perform miracles for Pharaoh, and also what Yahweh told him to raise to part and close the Red Sea.